Herman Cain campaign manager Mark Block made a striking accusation during an appearance on Special Report with Bret Baier last night, alleging that members of Rick Perry‘s campaign were responsible for “stirring up” the sexual harassment accusations against Herman Cain that have been in the forefront of political news. Block returned to Fox News’ airwaves earlier today, and was asked by host Megyn Kelly to respond to comments made by Perry staffer Curt Anderson, who had earlier denied having played any role in the story. Block’s response was, at best, a weak one. A quick Google search on Anderson reveals he’s a GOP strategist who worked on a failed senatorial effort by Cain back in 2003-04, and has been working on the Perry campaign for the past few months. 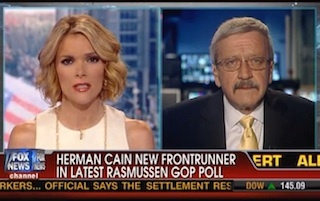 Block had been fairly explicit in his allegation that Anderson played a role in these leaks, but as Kelly set up the story herself, during his own appearance earlier on Fox News, Anderson “had only nice things to say about Cain,” then challenged “any reporter to whom he’s ever shared anything about Herman Cain to go ahead and report exactly what he said.” She then followed up by asking Block if he stands by his accusations. To say that Block looked like a deer caught in the headlights does a disservice to deer. His confused response, which you can watch for yourself below courtesy of Fox News, appeared to at the same time strike a forgiving tone towards Anderson, but not back away from what he had previously called a smear. The appearance reasserts the growing concern among many political pundits that the more damning issue with this harassment story is not the pattern of behavior it may or may not suggest of the candidate, but the inept handling of the allegations at every possible turn.